Tower Bridge, built in the 1880s, is one of London’s most famous landmarks and it spans the River Thames near to the Tower of London. It’s a great piece of architecture and the workings inside are fascinating too. We’d recommend the Tower Bridge Exhibition which shows you how it works and how they built it. It takes you right up to the top of the towers and back down to the engine room. If you don’t want to see the exhibition and take the tour, you can of course just walk across the bridge for free and you get a great sense of the scale of the structure by doing this. The Tower Bridge Exhibition is open daily in the summer from 10am to 6.30pm and in the winter from 9.30am to 6pm. Adult admission is £8, children £3.40 and family tickets are also available (2012 prices). One of the most magical sights on the Thames is to see Tower Bridge opening to allow boats to go through. If you want to catch this spectacle, check out the bridge opening times. A good place to view this is from the walkway in front of the Tower of London. 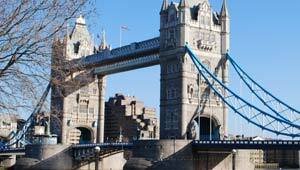 You can see Tower Bridge on most of the river cruises available on the Thames and there are a range of options with latest prices here: Thames River Cruises. After your visit to Tower Bridge, we’d recommend taking a walk down the re-developed South Bank of the Thames past the “Bee Hive” mayor’s offices to the Hays Galleria wharf which is full of restaurants and shops.